Enterprise Resource Planning (ERP) Systems can be classified according to how they are deployed and implemented. Generally, there are three types of implementations namely, On-Premise, Cloud ERP or Cloud-based and Hybrid Implementations. The type of implementation can deployment speed and the total cost of ownership of the ERP System. Before we discuss the finer details of the ERP system we must first answer the question, What is ERP? Most people describe ERP systems as accounting software because of its primary role of crunching numbers and balancing the sheets but ERP system go beyond the accounting department. ERP systems also directly affect other departments of the business like Marketing, Sales, Inventory, Human Resources, and etc. ERP integrates the functions of each business departments into one Omni channel system that allows for easier transfer for data and information between departments and improved efficiency. ERP systems automate several crucial business processes reducing errors and streamlining the sales, manufacturing, accounting, and financial processes. On-Premise ERP systems are the traditional type of deployment and implementation of an ERP system. From the name itself, an On-Premise ERP system is deployed on site of the business office in a physical space. Generally, On-premise ERP systems are isolated from the internet and consequently cannot be accessed remotely through the web. On-premise ERP systems have an inherent advantage in terms of data security compared to cloud-based ERP systems. Businesses are responsible for acquiring the IT infrastructure of the ERP systems like the hardware and server. Businesses opting for On-premise ERP systems are also responsible for the IT staff needed to maintain the IT infrastructure. This results in a higher upfront implementation cost compared to cloud-based ERP systems. The high upfront cost presents a barrier for entry for small and medium businesses that is why ERP systems were predominantly reserved for Large businesses in the past. Cloud ERP or Cloud-based ERP systems have recently grabbed the attention of large businesses because of the increasing popularity of Software-as-a-Service (SaaS). Cloud-based ERP systems are hosted by the vendor or service-provider like NetSuite. This means that businesses no longer need to worry about the cost of procuring the expensive IT infrastructure needed for an On-Premise ERP system making it an attractive solution for small, and medium businesses. Cloud-based ERP systems like NetSuite have faster deployment and implementation times. Cloud-based ERP system can easily be customized and integrated to other third-party cloud-based SaaS. Businesses can also tap Netsuite Solutions Provider Partners like Excelym to help them with their implementations, customization, and integration. Cloud-based ERP systems like NetSuite have better accessibility than On-Premise ERP systems. Businesses can access their ERP systems from anywhere in the globe with the internet through a web browser. The type of implementation or deployment can greatly affect the initial upfront deployment cost of the ERP system. The type of ERP system also greatly reflects the total cost of ownership. The type of implementation affects the total cost of ownership of an ERP system because of several factors like the software licenses itself, the number of users, the size of the business, the implementation staff involved, the degree of customization, the number of third-party integrations. These associated cost add-on to the total cost of ownership of the ERP system and each type of ERP systems can have different rates because of their differences in deployment, the extent of support needed and how the ERP vendor sells its licenses. On-Premise ERP systems require a single upfront payment of the licenses together with the implementation costs, and the cost of procurement of the IT infrastructure. On-Premise ERP systems also require a substantially smaller annual support fee that includes bug fixes, and system upgrades. Cloud-based ERP systems require a monthly recurring fee depending on the number of users, type of ERP package, support package and other add-ons to the ERP systems. 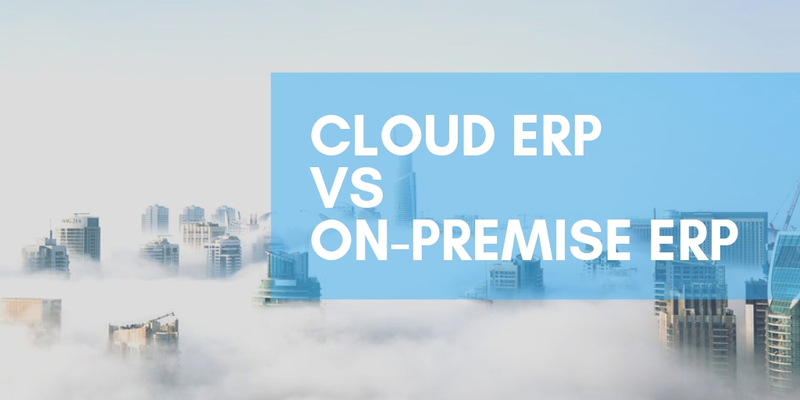 Cloud-based ERP has minimal upfront cost compared to On-Premise ERP systems. 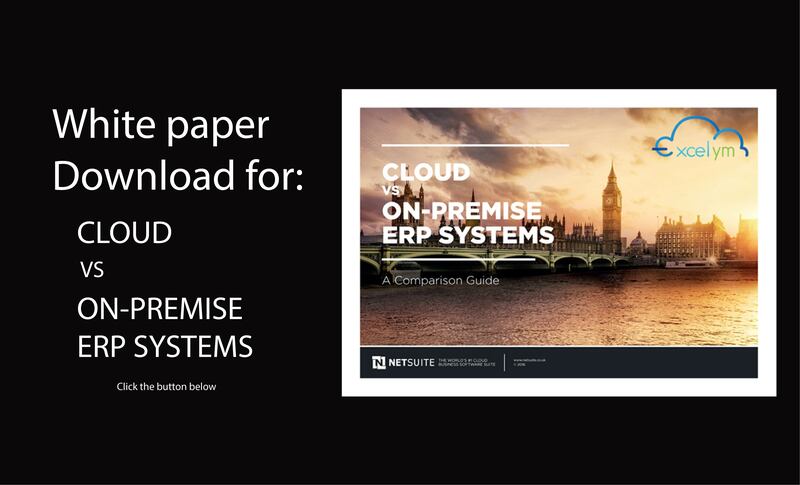 On-Premise ERP Systems require higher implementation costs compared to Cloud-based ERP systems because of the high cost of installing the on-site IT infrastructure for the ERP system. The cost of the recruitment and training of IT personnel needed for the upkeep and maintenance of the on-premise ERP system also adds to the implementation costs. The cost of securing the necessary office space to house the IT infrastructure should also be taken into account. On-premise ERP system requires longer implementations compared to Cloud-based ERP systems adding to more disruptions to normal business. Cloud-based ERP systems are hosted on the Vendor’s server and IT infrastructure and does not require complex on-site reconfiguration to the company’s existing computer and IT infrastructure. Cloud-based ERP like NetSuite can be deployed and fully functional with 4 to 8 months with minimal disruptions to business operations. The faster implementation allows businesses to recoup their investment with ERP system faster compared to On-premise ERP systems. One of the advantages of ERP systems is that they are easily customizable and can be tailored fit according to the needs and requirements of the business. Businesses directly control the data and how it is accessed in an on-premise ERP system which makes it easier to customize. However, customization of an on-premise ERP system is significantly more expensive than cloud-based ERP systems. Cloud-based ERP systems are significantly harder to customize than on-premise ERP systems but Solutions Provider Partners like Excelym allows businesses to customize their ERP system according to their requirements at a significantly lower cost compared to on-premise ERP systems. On-Premise ERP systems have a complex and complicated support system because of the different software and hardware requirements of the ERP system. As the On-premise ERP software gets updated the on-premise hardware may not be compatible and businesses are forced to update their IT infrastructure to cope. In other circumstance, the software may be phased out into a legacy system and businesses are forced to migrate to a brand new ERP system altogether. Cloud-based ERP systems have a simpler support system because when vendors like NetSuite roll out an update, the clients automatically receive an update without needing to worry about the IT infrastructure. Both Cloud-based and On-premise ERP systems have their own distinct advantages and disadvantages that is why it is always a good idea to consult with solutions provider like Excelym so that businesses can define their requirements and specifications. ERP systems both cloud-based and on-premise represents a significant investment for small and medium businesses that is why it is always advisable to consult first before undertaking the crucial step of implementing an ERP system.